We plant a new rose bed each year, these are available from the 1st of January onward. 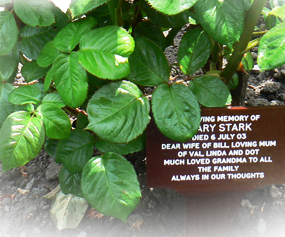 Each rose has an inscribed plaque and a flower holder for freshly cut flowers. The lease of the rose is for 10 years. Unfortunately this is not renewable as in order to maintain the quality of our rose gardens the bed is replanted at the end of the period. However, you are welcome to buy another rose if you wish. In order to maintain the rose gardens as a dignified memorial area, we request that nothing is placed on or by the rose bush, except for a modest floral tribute of freshly-cut flowers, which should be placed in the vase provided.